Conventional history places the exact location of Filippo Neri's birth in Florence on the south side of the Arno. However, local folklore suggests an alternate location: in one of two rooms of the same Borgo Pinti house later owned and occupied by Antonio Neri's family. 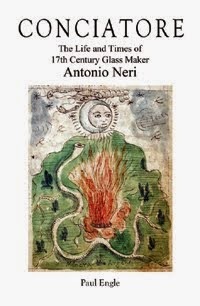 The common family name of Neri naturally leads to the question of whether or not the saint and the glassmaker were of common ancestry. Antonio's father, Neri Neri, maintained that his own father, Jacopo, was a cousin to the holy man. The assertion that Neri the medical doctor and Neri the holy man were true blood relations has yet to be verified. However, there are positive signs: the saint's well-established genealogy meshes with records of Antonio Neri's family housed at the state archives in Florence. In fact, both sets of records—of the alchemist and of the saint—share a single file in the archives. These documents indicate a common ancestry at the level of third cousins. The elder Jacopo Neri and Filippo Neri (later Saint Philip) appear to have shared a great-great-grandfather. It is a remote connection, but one that was a source of pride for Antonio’s father. There is also a notable similarity of family crests; the shield of Saint Philip Neri's family feature three stars on a blue field, that of Antonio Neri's family features a banner with three stars against a blue rampant lion. The Saint's genealogy is well established, but the matter is complicated in that Antonio's branch of the family left Florence around the start of the sixteenth century. Here we lose track of them for one generation. Regardless of the difficulties, there is mounting evidence that Antonio's fourth-great-grandfather, Michele di Neri, was the brother of Saint Philip's second-great grandfather Ser Giovanni di Neri. A further association with Filippo Neri lies with Antonio Neri's maternal grandfather, Francesco Parenti, who served as attorney for the saint’s sister Caterina in the execution of the holy man's will. Filippo Neri was unusual for his time. He was a champion of the common man, and he was humble to a fault; not a leader by force, by wealth, nor by charisma, but by gravitas. Antonio Neri's father seems to have been a man from the same mold, as exemplified by the absence of self-import declarations or artifice. He admired Filippo Neri, and we can guess that he shared the holy man's philosophy. Filippo never wanted and protested strenuously against any aggrandizement. We see this trait follow through with Antonio. In his manuscripts and in the book on glassmaking, there is no evidence of boasting, or name-dropping, nor claim of superiority. What we see is a humble quest to understand nature, and to be of service to mankind.